Capler Wood Cottage and the Ballingham Fishery is surely one of the most idyllic combinations imaginable for a lover of fishing. The cottage was formerly a pair of cottages which were combined some years ago to create a comfortable period house overlooking unspoiled meadows and the River Wye in Herefordshire. 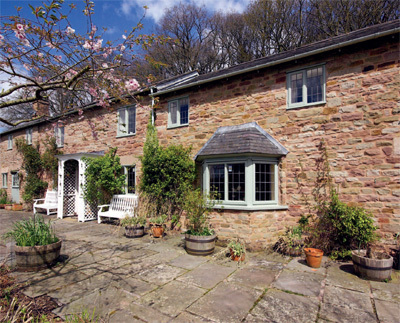 Completely refurbished, the cottage now has spacious accommodation with flagstone floors and exposed beams. There are two reception rooms – the sitting room has a notable shuttered bay window and an open fire and the kitchen has an attractive, farmhouse feel. The first floor is served by a pair of staircases, as when it was two cottages. Upstairs, above the sitting room is a large en-suite bedroom; the house has two further bedrooms and a family bathroom, and all upstairs room enjoy magnificent views. The gardens run to three sides of the house and are mature – they were laid out twenty years ago. A flagstone terrace catches the sun, while the majority of the gardens comprise lawns and mature shrubs and trees including Holly, Beech and Silver Birch, with a dominating theme of apple orchards. There is a carpet of bluebells in springtime. At the far end of the garden is a boat hut which offers excellent river access. The fishing is exclusive double-bank on the Wye, approximately ¾ mile in length and incorporates 15 known pools. A prolific and well-known salmon beat in the past, this stretch has only been lightly fished for pleasure in recent years. The local village of Fownhope has a post office and general stores; a butcher’s shop, a doctor’s surgery, a health and leisure centre, an excellent school and two renowned public houses. The Cathedral city of Hereford (7 miles) with its extensive shopping and schools is a short drive and offers a rail service to London. The guide price is £675,000. For further information please contact Knight Frank on 01432 273 087 or visit www.knightfrank.co.uk.